I've been meaning to write a post for a long time about that "other" 1950s musical idiom, jazz. For me, Rockabilly is OK, and I enjoy it to a point, but my real interest in music is the jazz of the decade. I suppose since we just lost one of the icons of the genre, and a musician I had the utmost respect and admiration for, Mr. Dave Brubeck, yesterday, this is a good time to do it. I think many of us lose interest in jazz once we get past big band swing. The whole notion of bebop and progressive jazz is kind of stuck in an intellectual fog; most people believe they have to really know something about it to enjoy it. Not so. Jazz is probably America's greatest contribution to world culture; the idea that creative energy can flow unrestricted is the very essence of freedom. Just go into it with an open mind, and I bet you will find something to enjoy. After that, like any other form of music, you go deeper from there. Bebop jazz in the 1950s was the language of the Beat generation. The Jack Kerouac crowd was drawn to it for its free form and spontaneous emotion, much like the literature they produced. Many of the artists knew each other and fed off one another. Milestone recordings from the era, probably must-haves for any serious music listener would be Charlie Parker with Strings (1950), Miles Davis' Kind of Blue (1959), Clifford Brown's Study in Brown, 1955 (my personal fave), and Chet Baker and Strings (1953). All of these are eminently accessible, many feature recordings of standards which you will probably recognize, and you will enjoy them if you check them out. Probably one of the most notable recordings of that time, and of any time, is Brubeck's Time Out. Brubeck was such an solid musician; he sought out ways to be different and innovative, beyond just virtuosity on the piano and improvisation. 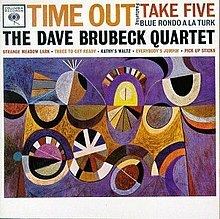 Time Out, recorded in 1959, was devoted to making music in different, and rather unusual (for jazz) time signatures. Tunes in 5/4, 3/4, 9/8 make up the bulk of the album. However, that said, it is simply good music, and the fact that the time signature is a little different has really nothing to do with the accessibility of the music. It was the first jazz album to sell a million copies and is probably still selling in record numbers. Do yourself a favor and buy it- I guarantee you will like it, and probably you have already heard some of the tunes, you just didn't know it. I was fortunate to be able to see Dave Brubeck and his Quartet live back in 1993, and meet him in person. It was a highlight of my concert-going existence and I treasure that memory. How wonderful that you got to meet him! The music world has truly lost one of its finest. Great post. A friend got me interested in jazz during a business trip to New Orleans this year, and this Brubeck album is one I've been enjoying. It's hard to beat live jazz. Rushed out and bought a two disc CD of his greatest hits, so nice.